MAC OS has an awesome feature which allows you to show the shortcut of Removable drive on Desktop. In Mac every time you plug in the USB drive or slide a CD or DVD into a drive you can see the drive icon on the desktop screen. Now you can add this feature on your Windows machine with a free app TweakNow DriveShortcut. With the help of this free application you can enjoy the same MAC feature on your Windows desktop. So every time you plug an external hard disk or removable drives into your computer, an icon that represents the newly plugged hard disk added to the desktop. All you have to download this free TweakNow DriveShortcut app on your PC and run the program to get started. 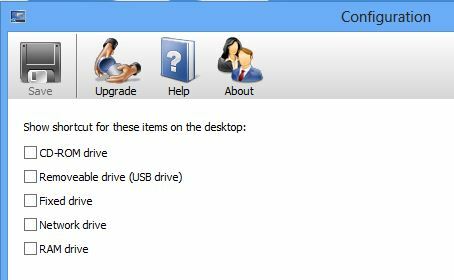 At first time of run it will ask you which types of drives you want to show on your desktop screen like CD/DVD drives and USB drives etc and you can also have the program to remember the position of the drives icon on the desktop. Just tick the boxes next to those you are interested in. After that close the application and plug in the USB drive on your windows PC and now you can see the USB drive shortcut on your desktop. When a CD, a DVD, or an external hard disk added or removed from the computer, Windows will broadcast a message to all running programs to notify them about this new change. And you can see all these changes on your desktop with the shortcuts. The app is one of the easiest way to add shortcuts icons for removable drive in the Windows desktop, with this way you can access all your removable drive easily, no need to go to the My computer explorer to search the drives. You have to must try this app on your windows PC.